There are several examples in life where the name or brand of an object becomes so synonymous with its function, that it actually becomes adopted as the very description of its intended use. The obvious example is of ‘Hoover’ being used instead of vacuum cleaner; Sellotape for clear adhesive tape … or one that we come into contact on a regular basis as windsurfers – Velcro. There are also instances when the design, purpose or requirement of an object changes over time, rendering it (or its name) nonsensical. Coca Cola is an example we have all heard of – formulated and founded by a Confederate Colonel, John Pemberton, in the late nineteenth century. He was wounded in the American Civil War and had become addicted to morphine so started on a quest to find a substitute for the problematic drug. Originally called French Wine Coca, when he came up against prohibition legislation in 1886 he renamed his medicinal concoction Coca Cola after its two main ingredients – Cocaine (the coca leaf) and the Kola nut for caffeine. The original amount of cocaine in the mix was not insignificant and was of course removed from the ingredients in 1903 … and yet the name lives on. This test was originally published in the January/February 2018 issue. In windsurfing we’ve had countless fads and concepts that have been and gone as the sport has matured and design developed. For example, flapper boards (course racing boards of the mid-nineties with the fin placed right on the rear), with their plastic strip screwed or glued onto the tail to mitigate spin out or loss in control. Z-booms, needle masts, asymmetric boards, chest harnesses … the list could go on. One thing that has remained consistent throughout, for as long as I can remember, is the crusade to produce a style of short board for the market that fulfils as many roles as possible. Originally, this design style was called a wave-slalom, but as the two disciplines grew apart and went opposite directions, so too did the relevance of the name. Along came the ‘chameleon’ board in the mid-nineties to take its place, before the youthful freestyle discipline burst onto the scene and turned everyone’s heads. 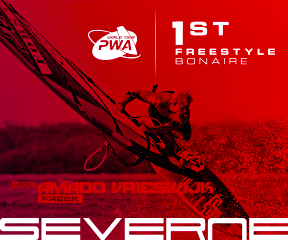 Combining the two manoeuvre-oriented disciplines of wave and freestyle seemed the most natural thing. If you want to do stunts and tricks in high winds, no matter what the sea state is, then these were the obvious go-to tools. And yet time is a cruel beast and sends us careering off down paths where competition winnings are the sole focus, driving a gulf between the disciplines once more. Today, the accepted design parameters for a freestyle board are very different to that of a wave board – boxy chunky rails instead of rounded; corky riding style on top of the water instead of sitting in and feeling connected. As a telltale sign of this, there are only two of the seven brands on test here that class their boards as ‘freestyle wave’ boards. The rest use the term ‘freewave’. So FSW has, in effect, become a name that people use to describe a versatile, all-round platform rather than an accurate reflection on the board’s intended use. 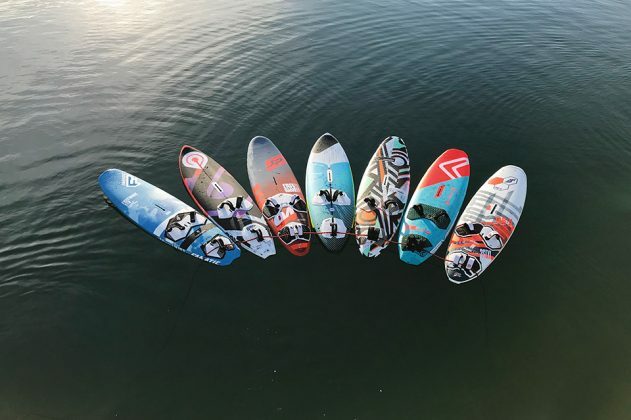 Looking at the board designs amongst the group, there are a healthy number of new shapes, largely brought about by the adoption of the ‘compact’ concept developed and nurtured in the wave board category. And yet, as with all developing ideas, the lessons learned are already becoming apparent and the ‘extremes’ are being phased out in favour of more subtle refinements to the conventional. For example, the JP, Fanatic and Severne are all adopters of the ‘compact’ notion … and yet there is certainly nothing ‘stubby’ about their lengths compared to the rest of the group. They all retain a more conventional length and rocker-line, for the noticeable benefits of early planing, control and comfort. Instead, their outlines and designs adopt other considerations from the compact concept – parallel rails, low noses and a shift in stance towards the rear. For a category that seemingly continues to be redefined and has its focus shifted, it is great to see that brands continue to challenge the rules, for the benefit of us, the end consumer. Another massive shift in performance in this category has been brought about by the use of multiple fin setups. All bar one of the designs here can be used either as a single fin or in thruster mode. For all the boards, it is true that a change in the fin used can significantly alter its character and the performance available. From coastal blaster to float-and-ride dominator; bump and jump platform to a riding style any dedicated wave board would be proud of. It is so worth experimenting with fin setups on all these boards to really understand just what performance range is available. We certainly had a lot of fun doing so. planing, user-friendly and very accessible, they come to life when used in a wave break and would be perfectly at home in a committed wave sailor’s quiver.